Bamboo has long been used in architecture, but in more recent years, it has been increasingly used to supplement other materials. Bamboo may be used during construction, or as an ornamental element on a building’s façade. Few works of contemporary architecture use bamboo as a primary building material, and architects instead perpetuate the same established uses for the plant. Yet its perceived constraints are exactly what makes bamboo so special. It is a lightweight material, and a flexible one — properties which make bamboo unsuitable in certain cases, but applicable in many more. Bamboo is also a relatively inexpensive material, and one that can be sustainably produced. Therefore it is no coincidence that many of the following projects, which often use bamboo out of necessity, are also designed to address issues relating to the environment and economic inequalities. All of the projects, meanwhile, are intended to demonstrate the potential of bamboo as an architectural tool, exploiting it to its full potential and varied capabilities. They represent a range of styles and serve a variety of purposes — but that is exactly the point. While each structure identifies one of bamboo’s powerful qualities, the projects collectively illustrate bamboo’s strongest trait: versatility. Turning to bamboo as a regional craft, ZCB Bamboo Pavilion is also intended to reconsider traditional uses of the plant as a building material. While universally valued as a lightweight and inexpensive tool, bamboo is often used to create rigid forms or temporary scaffolds. The ZCB Bamboo Pavilion demonstrates bamboo’s flexibility, and the potential for creating entire structures out of the supple yet sturdy material. Although the itinerant Big Bambú structure looks chaotic, like a bundle of randomly interconnected sticks, it is actually carefully constructed — while still embracing the organic and elastic nature of its material. The innumerable connections between bamboo trunks gives the structure enough strength to support the workers who climb the bamboo as they build. In a nod towards more traditional architecture, the structure also features wide arches created to allow spectators to view the work from the inside. The project does, however, rely on creative spontaneity, changing forms every time it is moved and reconstructed. Located next to a modern building, Chan Chan Tourist Station blends in with its surroundings by imitating the clean lines and abstract geometry of modern architecture, all accomplished through a bamboo structure. The repetitive lines of the structure’s barred walls and ceiling are multiplied by the intersecting shadows cast throughout the space, transforming the structure into a remarkable light display. Designed to greet tourists visiting the area, the building frames the surrounding landscape while offering respite from the sun. The clarity of Bottle Sail’s design makes it look like a simple structure, but it is actually intended to address a complex set of social, economic and environmental issues. The multipurpose building is used in part by farmers to house seedlings, and was commissioned by a group working to improve the quality of life in communities heavily impacted by HIV/AIDS. The structure is also built out of bamboo and recycled materials, minimizing both the cost of construction and the project’s impact on the environment. The idea behind Toigetation was also to create a community-minded structure, and as with Bottle Sail, simplicity was a practical requirement. Containing a restroom and wash area, the building is also covered by a bamboo frame with growing plants to make the structure both fresh and fruitful. The Cao Bang structure is intended to be a model for similar projects in other communities, drawing attention to the need for sanitation facilities in impoverished parts of Vietnam. 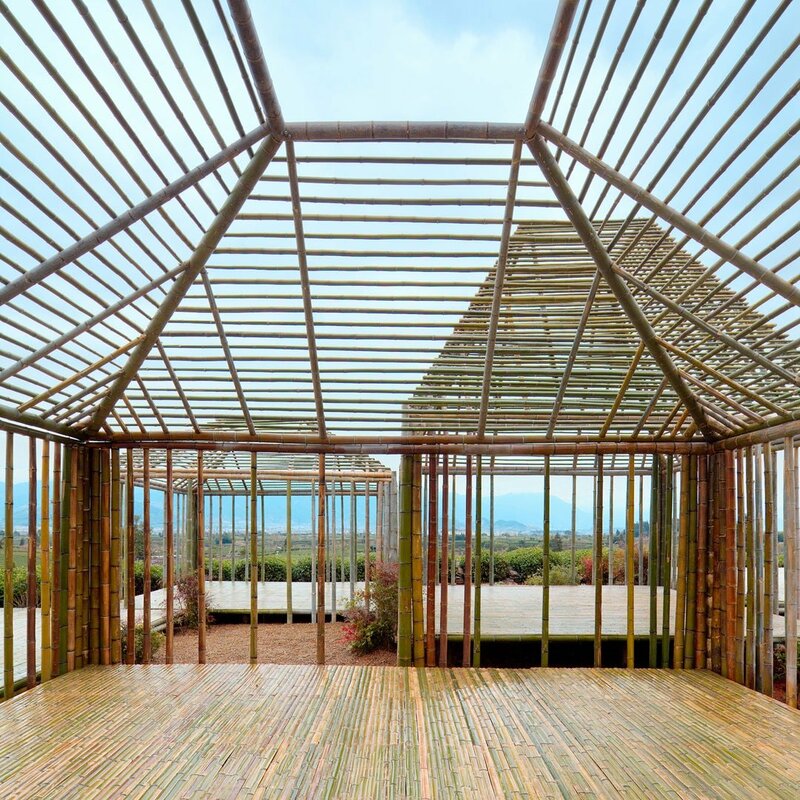 DnA’s Bamboo Pavilion is located in a region of tourist-attracting tea fields. The structure, therefore, is carefully designed to accommodate these tourists without disturbing the natural landscape or the farmers who work there. The simple structure is made up of bamboo frames which contain platforms for rest and viewing, without disrupting vistas of the surrounding fields. The pavilion’s profile also blends into the landscape by imitating the forms of nearby mountains. The prefabricated Green Ladder pavilion presents bamboo in a state between nature and architecture. Resembling the bamboo scaffolding often used in modern construction, the design presents the material in its most rigid form, dissociated from its origins. Yet the project abstracts this image, by bringing the scaffolding ladders tightly together to create a manufactured bamboo forest, bearing new life and ample greenery.